There aren’t many things better than an Australian summer on the Coast, but there aren’t many things worse (or more painful!) than accidentally getting burnt to a bright red crisp. Whether you’re surfing, paddle-boarding or lounging beach-side, protecting your precious pelt from the sun’s damaging rays should be a routine priority if you want to avoid waking up looking 80 on your 40th birthday. 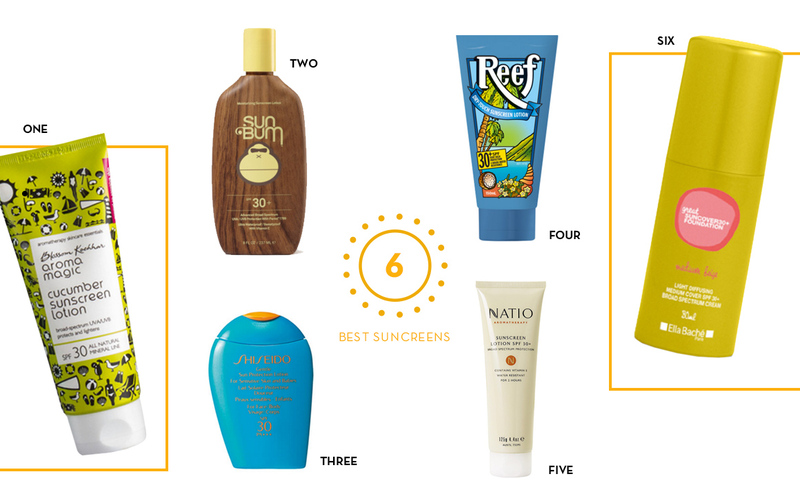 So, here are six of the best sunscreens that’ll help you put the slop in slipping, slopping and slapping this summer! If you shy away at the thought of chemically-laced lotions touching your skin, reach for Blossom Kochhar’s Aroma Magic’s line of aromatherapy skin care essentials. Their SPF 30+ all natural moisturising sunscreen is free from harsh chemicals, alcohol and artificial fragrance. Win! Sun Bum’s oil-free, broad spectrum products provide a sheer no-fuss, long lasting cover. Sun Bum is yet to hit retail stores in Oz (you can buy it online), but we think it’s not a matter of if, but when. OK, so it might be at the top end of your budget, but Shiseido’s hydrating water-repellent lotion glides on and soaks in effortlessly. In our humble opinion, when you love applying it there’s a better chance it’ll become part of your morning routine, thus making it worth the few extra bucks. To ensure your wee bottle lasts the summer, we suggest saving this gem for your delicate face and neck only. If you’re active or prone to forgo (aka: forget) reapplying, Reef’s non-greasy, four-hour water resistant sun lotion will keep you protected and smelling like a coconut pina colada. This one’s a Metropolist beach bag staple. This bottle of age-defying goodness from Natio is the bee’s knees if you’re on the go at work or on the weekend. Lightweight and hydrating coverage for the face, just pop your make-up on over the top (or go fresh and barefaced, girlfriend) and voilÃ ! If it’s good enough for six-time world surfing champ Stephanie Gilmore and friends, it’s good enough for us. Ella Bache’s SPF light-diffusing, make-up cream foundations are designed for everyday wear and protection while leaving you with a flawless complexion. And who doesn’t want that?